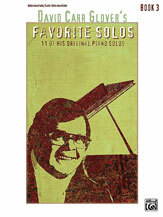 The contents of this book represent some of the composer's all-time favorite sheet music solos. Many of the solos are among the most requested by piano teachers and students alike. The varied styles of each piece make this book a valuable supplement to most piano methods. This book contains 11 intermediate to late intermediate pieces. Titles: Alaska * Etude * Festival * Festival of the Fountains * Go, Tiger Go! * The Hunters * New Orleans Blues * Nocturne * The Redwood Forest No. 1 * Rock-A-Way * Variations on a Minor Theme. "Go, Tiger Go!," "New Orleans Blues," and "Nocturne" are Federation Festivals 2014-2016 selections.